I am very excited to see the continuation of SoundTree’s Music Education & Technology Online Summit (METOS). I was very happy to be a part of the first METOS and can attest to its success and its far-reaching impact on music educators and the profession. This year’s METOS will feature the topic “Reaching the other 80% with music technology” and will be presented by some of the best researches, clinicians, and educators in the field. I STRONGLY encourage you to sign-up for this and attend the sessions. METOS will be held in the SoundTree Institute on Monday, October 10th, 2011 from 11:00am until 4:00pm ET. 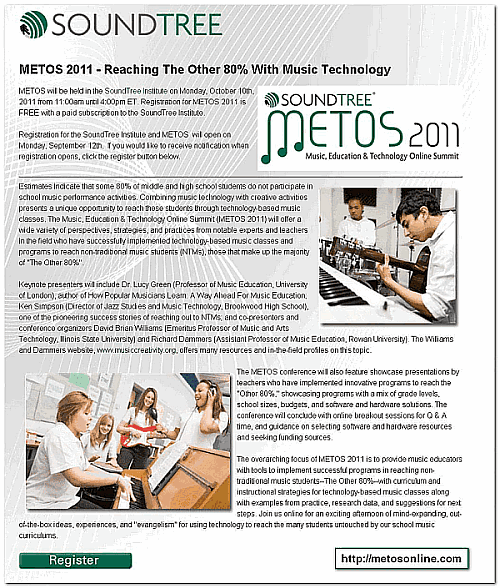 Registration for METOS 2011 is FREE with a paid subscription to the SoundTree Institute. Registration for the SoundTree Institute and METOS will open on Monday, September 12th. If you would like to receive notification when registration opens, click the register button below. Estimates indicate that some 80% of middle and high school students do not participate in school music performance activities. Combining music technology with creative activities presents a unique opportunity to reach these students through technology-based music classes. The Music, Education & Technology Online Summit (METOS 2011) will offer a wide variety of perspectives, strategies, and practices from notable experts and teachers in the field who have successfully implemented technology-based music classes and programs to reach non-traditional music students (NTMs), those that make up the majority of “The Other 80%”. Keynote presenters will include Dr. Lucy Green (Professor of Music Education, University of London), author of How Popular Musicians Learn: A Way Ahead For Music Education; Ken Simpson (Director of Jazz Studies and Music Technology, Brookwood High School), one of the pioneering success stories of reaching out to NTMs; and co-presenters and conference organizers David Brian Williams (Emeritus Professor of Music and Arts Technology, Illinois State University) and Richard Dammers (Assistant Professor of Music Education, Rowan University). The Williams and Dammers website, www.musiccreativity.org, offers many resources and in-the-field profiles on this topic. The METOS conference will also feature showcase presentations by teachers who have implemented innovative programs to reach the “Other 80%,” showcasing programs with a mix of grade levels, school sizes, budgets, and software and hardware solutions. The conference will conclude with online breakout sessions for Q & A time, and guidance on selecting software and hardware resources and seeking funding sources. 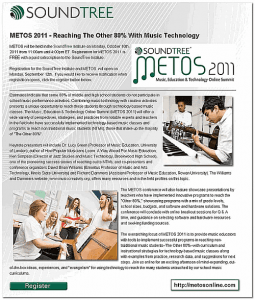 The overarching focus of METOS 2011 is to provide music educators with tools to implement successful programs in reaching non-traditional music students–The Other 80%–with curriculum and instructional strategies for technology-based music classes along with examples from practice, research data, and suggestions for next steps. Join us online for an exciting afternoon of mind-expanding, out-of-the-box ideas, experiences, and “evangelism” for using technology to reach the many students untouched by our school music curriculums. I hope that you will consider being a part of this amazing event and also take the time to look at the offerings of the SoundTree Institute!